Usually, when it comes to smoking limitation, some would argue that it violates our rights, infringe on personal liberty, my health – I do what I want. But we tend to forget one simple rule, "the freedom of one ends where the freedom of another begins". And if anyone has the right to breathe harmful smoke, the same way someone else has the right to breathe clean air. Actually, in many respects - clean air is the reason why most of the people go to Samui. Recently we have published the news on our website about the administration of the island of Koh Samui wanting to make the air cleaner by limiting smoking. Very laudable initiative! Because while living here and enjoying breathing the pure sea air, it can be very unpleasant to inhale cigarette smoke from a bunch of tourists sitting at the near table of your favorite cafe. In most Western countries there are strict measures being taken against smoking, especially in public places. So why do foreign tourists believe that in Thailand everything is allowed? I hasten to disappoint them: a sense of freedom that comes from European regulations and laws and a general rule “if you are a farang everything is acceptable” might be deceptive. Back in 1992, Thailand adopted a law about protection of the health of nonsmokers. Under this law, the rights of the citizens are protected by the state. In restaurants, bars and other public places specifically designated smoking areas should be allocated, and there should be much more space for non-smokers. The administration of any institution that violates the law (has not allocated or indicated such smoking free zones, has not specified the penalties for violation, etc.) can be fined 20,000 baht. 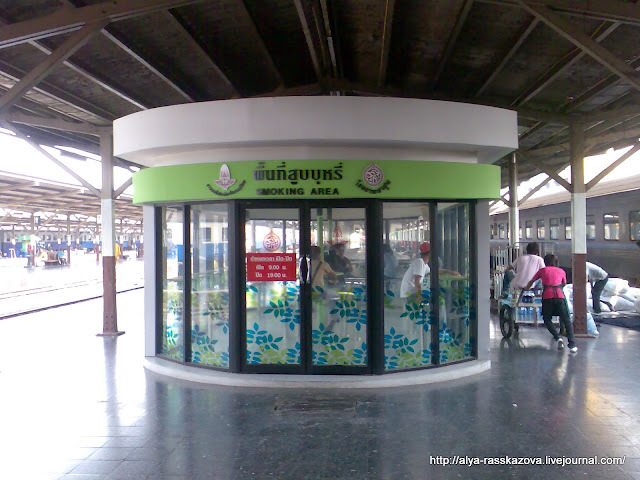 Customers caught smoking in such place are also fined - 2,000 baht. So, dear tourists, while smoking a cigarette in a usual "roadside cafe" be prepared to part with your money. Since the cafe owners are very unlikely to have allocated a smoking area, and lighting a cigarette in its territory automatically breaks the law. By the way since 2008 in enclosed areas of hotels, restaurants, hairdressing salons, etc. smoking is prohibited in any way. Of course, nothing can reach a heavy smoker. Especially the common phrase "The Federal Ministry of Health warns ..."
Considering the fact that the cigarettes in such packages are "not good at all" (I do not know since i do not smoke, but allegedly "experts" say that local cigarettes taste like garbage), then those who come to Thailand for a long stay have a wonderful excuse to quit smoking. - Local athletes refuse any sponsorship from tobacco companies. - Tax on the cigarettes sales is regularly increasing. - The rights of non-smokers are marked by a special law passed in 1992. - New laws such as the law of 2008 on the prohibition of smoking in enclosed areas are being passed. In addition, anti-tobacco advertising is widespread in Thailand's - Thais have become the first nation in the world to speak openly about the fact that smoking causes impotence. In general, the anti-tobacco campaign run by the Government of Thailand is considered to be the most successful in Southeast Asia. According to official statistics, the number of smokers in the country has steadily decreased. Yes, after the excise duty was increased up to 83.5% the cigarette retail prices increased by almost 400%. But the number of smokers has decreased by half, and mostly thanks to the young people. There is a widespread belief that Thailand is a country where everything is allowed. And so we can act accordingly - rather relaxed without looking at the limits of decency. For example, on Koh Samui, we repeatedly encounter tourists driving around the island in their swimming suits (both men and women). Also there are tourists entering stores with naked torso (males) or in a transparent dress (sometimes wearing only swimming suits, carrying sarongs in their hands). And I cant help but feeling shame and embarrassment for such "guests". It would be nice to remember that you are in a foreign country with well established traditions, where even holding hands and kissing in public are considered as a sign of promiscuity. As for motorcycling and appearing in public in swimming suits - it is prohibited by the law of Thailand. And if you have never been stopped and called to order, it does not mean that the locals will never get tired of it. After all, think for yourself - how would you treat such brusque guests who do not abide to simple rules of propriety?